Standard and Poor has ranked 116 nations according to their vulnerability across three indicators: proportion of population living lower than 5 meters (16 feet) above sea-level, share of agriculture in economic output and a vulnerability index compiled by Notre Dame University. It ranks India at 101 and Pakistan at 94 while Bangladesh is ranked at 114 along with Vietnam at 115 and Cambodia at 116 as the most vulnerable among 116 countries. China is ranked at 82. Among African countries listed as most vulnerable are Senegal (113), Mozambique (112) and Nigeria (109). Both India and Pakistan have seen recurring droughts and massive flooding in recent years which have resulted in large numbers of deaths and injuries in addition to property losses. India has seen one farmer commit suicide every 30 minutes over the last two decades. The fact is that the developing countries facing huge costs from climate change can do little to control it without significant help from the rich industrialized nations most responsible for it. The World Bank is warning that this could lead to massive increases in disease, extreme storms, droughts, and flooding. Unless concerted action is taken soon, the World Bank President Jim Kim fears that the effects of climate change could roll back "decades of development gains and force tens of more millions of people to live in poverty." Canada I would agree;but not US US is definitely vulnerable. S & P is blinkered;but hey was blinkered about likelihood of fin crash also! Eastern sea board water rising more than anywhere in world already. West in drought that may last decades (and CA temp hits record not even felt during 1930s!) and Great Lakes already under stress. On top of that US is tapping out aquifers. Even worse tapping out giant fossil aquifer. A fossil aquifer is one that cannot be replenished in our lifetime or many others. "The problem with drawing too much water from an aquifer, which has been stored in these geologic formations for thousands of years, is that it can’t easily be restored once pumped dry. That’s the crisis facing farmers who rely on the Ogallala Aquifer, which once contained enough water to cover the entire continental U.S. roughly half-a-meter deep. Once pumped dry, the Ogallala would take at least 6,000 years to refill." There is a prediciton there will reverse migration from West. There goes what is left of Great Lakes! Can California survive this dire drought? Scientists discover that seven Western states are depleting groundwater reserves at an unprecedented rate." "The Great Lakes are under a lot of stress. 34 different kinds of stress, to be exact." 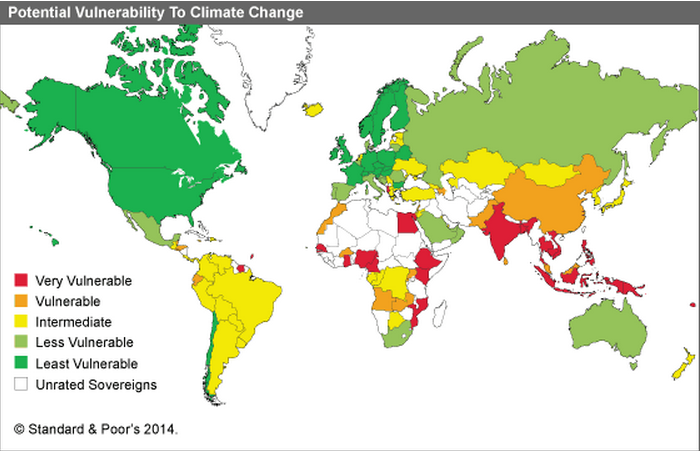 According to the results, Cambodia, Vietnam, and Bangladesh could be most affected by climate change. Luxembourg, Switzerland, and Austria would be least affected (probably because they're rich, land-locked, and don't depend on farming). The United States is 10th least vulnerable, sandwiched between France and Poland. India was added by amusing Haq himself ! Experts say India is likely to be hit hard by global warming. It is already one of the most disaster-prone nations in the world and many of its 1.2 billion people live in areas vulnerable to hazards such as floods, cyclones and droughts. Freak weather patterns will not only affect agricultural output and food security, but will also lead to water shortages and trigger outbreaks of water and mosquito-borne diseases such as diarrhea and malaria in many developing nations. "All aspects of food security are potentially affected by climate change including food access, utilisation of land, and price stability," said Revi, adding that studies showed wheat and rice yields were decreasing due to climatic changes. The IPCC lead authors said India, like many other developing nations, is likely to suffer losses in all major sectors of the economy including energy, transport, farming and tourism. For example, evidence suggests tourists will choose to spend their holidays at higher altitudes due to cooler temperatures or the sea level rises, hitting beach resorts. India ranked as the most vulnerable of 51 countries in terms of beach tourism, while Cyprus is the least vulnerable in one study which was examined by the IPCC scientists. Extreme weather may also harm infrastructure such as roads, ports and airports, impacting delivery of goods and services. "The world has realised mitigation is absolutely critical and probably the most effective form of adaptation but adaptation processes have to be accelerated, especially in ... lower middle-income countries like India," said Revi. Like most people, you think that climate change is really a science. It is not, for the simple reason that no one really understands it. Consider, for example, that the increasing CO2 level (319 ppm in 1958 vs. 396 ppm in 2014) have demonstrated a darn good effect on crops production, and nearly every major crop (wheat, corn, maize, rice, etc.) has shown a darn good increase in per acre yield over the last 20 years. For example, per acre yield of corn in the US has increased SIX folds in the last 10 years. Look also at Pakistan, India, etc., which have increased their crop productions without placing any additional land under cultivation since there is no additional land available anyway. And it is not just fertilizers or mechanizations alone. You should understand that increased CO2 levels help the plant leaves fight the negative effects of ozone, or O3, which is being produced by pollutants interactions with the atmospheric gases. But O3 is a self-regulatory atomospheric component and it keeps going up and down, generally for no known reason. So far as the earth temperature rise is concerned, this is not the first such cycle on this planet. What do you think the Bible, Torah, and Holy Quran are saying when these books talk about the Noah's arch and the rise in the oceans? These temperature rises have a lot more to do with solar fusion activity, which in turn is likely related to the activity in the center of Milky Way Galaxy, which in turn is likely related to the Great Attractor, which is supposedly the center of all known galaxies, nearly 100 billion of those. As for rising sea levels or shrinking arctic ice, note that NASA's imaging has established that while Arctic Ice Extent has reduced generally around 4.1% per annum, the Antartic Ice Extent has increased about 1% per year. Given the sizes of the two Ice Extents, the total sea ice has in fact INCREASED about THREE FOLDS over the last 10 years. In short, mankind's knowledge of the atmosphere is a lot more limited than the science of human biology. The so-called climate change is "real" only to the extent that it is measurable. As to whether the humans are contributing to it in any significant way, it is all a bunch of assumptions knit together for commercial reasons. P.S. I recently reported on this subject in a Richmond City Council meeting to oppose some funding that the city was to provide to a couple of PhDs working on City's Climate Change. The funding was killed. Singh: "India was added by amusing Haq himself !" Look at the map in the post. Can you identify India on a world map? Can you tell red from other colors? Try and see if you can!!! It is time we started looking at climate change in the context of population. As a case in point, any drop in the monsoon below 85% is technically classified as a drought! Compare that with the recent drought in California where there was hardly any rain at all. Every year, I travel back to india only to find our aquifers being depleted. In some places, wells have been dug up to 300ft depths. Incessant development and a hungry middle class do not seem to get it either. While Pakistan may not be as vulnerable as India on the map, we are geographically too similar to ignore shared consequences. Never mind climate change. Please write an article about India's mars probe. Our TV people are constantly talking about it. In your article you could expose the fact that even though the Indians are taking ALL the credit for the mars mission, the mission actually received significant help from US (control & communication) and Russia (satellite-launcher parts). "During the weekend, Greenpeace released a batch of documents obtained through the Freedom of Information Act that showed (climate change denier Wei-Hock) Soon received more than $1.2 million from Exxon Mobil, Southern Company, the American Petroleum Institute and the Charles G. Koch Charitable Foundation. Soon didn’t disclose the money on at least 11 papers since 2008, reported the New York Times. The paper and other news organizations reported this appeared to be a violation of the journals’ ethical guidelines. Pakistan is planning to submit its plans for tackling climate change to the United Nations by September this year as the country’s Ministry of Climate Change is finalising the INDC (intended nationally determined contributions) draft. In an exclusive interview with the RTCC, federal minister for climate change Senator Mushahid Ullah Khan said that Pakistan’s INDC would mainly focus on mitigation and adaptation in six sectors including energy, transport, agriculture, forestry, industry and waste. The INDCs are the commitments that are required from more than 190 countries under the United Nations Framework Convention on Climate Change (UNFCCC) for addressing climate change beyond 2020. The proposals are intended to set the stage for the negotiation of a new global climate pact in Paris, in December 2015. Pakistan is finalising its INDC with technical support from World Bank, Lead-Pakistan, International Institute for Sustainable Development (IISD), Energy Research Center of the Netherlands (ECN) and Pakistan Center for Climate Research and Development (CCRD). Climate tracker: Who has pledged what for Paris summit? The minister said that Pakistan remains to be one of the most vulnerable countries to adverse impacts of the climate change like floods, droughts, climate and weather variability; therefore effective adaptation measures will also be part of the INDC. “The biggest challenge for Pakistan is to ensure survival of floods and droughts affectees and traditional crop patterns,” he said, adding Pakistan is a glacier-fed country and it would be facing severe water shortages and flooding in the next 25 to 50 years. The minister said Pakistan needs support of rich countries to cope with the adverse impacts of the climate change as the country requires US$10-15 billion annually to ensure mitigation and adaptation measures. “We urge the developed countries that are in fact polluting the world through their industries to extend financial support to Pakistan besides transferring technology and capacity building in climate change related fields,” he said. The death toll in the heatwave sweeping India has passed 1,000, with temperatures nearing 50C (122F) in some areas. Most deaths have taken place in the southern states of Telangana and Andhra Pradesh, where at least 1,118 people have died since last week. Reports say at least 24 people have died from the heat in West Bengal and Orissa. Temperatures are likely to drop in some parts over the coming days. Hospitals are on alert to treat heatstroke patients and authorities have advised people to stay indoors. Heatwave conditions have been prevailing in the two worst-affected southern Indian states since mid-April, but most of the deaths have happened in the past week. In the worst-hit state of Andhra Pradesh, where temperatures climbed to 47C on Monday, 852 people have died. "The state government has taken up education programmes through television and other media to tell people not to venture into the outside without a cap, to drink water and other measures," news agency AFP quoted P Tulsi Rani, special commissioner for disaster management in the state, as saying. "We have also requested NGOs and government organisations to open up drinking water camps so that water will be readily available for all the people in the towns," he added. In neighbouring Telangana state, 266 people have died in the last week as temperatures hit 48C (118F) over the weekend. Alfred Innes lives in its capital Hyderabad and says members of the public have received little help so far. "I have personally witnessed the death of a three-year-old very close to where I stay and that was because of severe heat. It's very sad. "The government isn't doing much, but as individuals we are trying our best," he added. Temperatures fell slightly in Telangana on Tuesday, and are expected to start dropping in Andhra Pradesh by the end of the week. The weather is likely to cool further when the summer monsoon begins at the end of the month. The Indian capital, Delhi, is enduring a week of sweltering heat as the maximum temperature in the city hit a two-year high of 45.5C (113.9F) on Monday. The Hindustan Times newspaper carried a front-page photo of a zebra pedestrian crossing in the city melting in the heat. "It's baking hot out here - our outing has turned into a nightmare," said Meena Sheshadri, a tourist from the western city of Pune, who was visiting a Delhi monument with her children. The meteorological department has issued a warning for Orissa, Jharkhand and Andhra Pradesh states saying that maximum temperatures there would remain above 45C (113F). Meteorological officials said the heatwave was due to a lack of rain. There are fears that some of the worst-affected states could be hit by drought before the monsoon rains arrive. The monsoon is expected to hit the southern state of Kerala towards the end of this month before sweeping across the country. Bill Gates, Mark Zuckerberg, Richard Branson, Jeff Bezos, and pretty much every other crazy rich tech leader you can imagine have announced that they’re banding together to combat climate change with a new partnership called the Breakthrough Energy Coalition. Their timing couldn’t be better—or more telling. Through the partnership, the group’s members have committed to use a substantial portion of their hundreds of billions of dollars in collective net worth to invest in early stage clean energy companies. The timing of the announcement coincides with the global climate conference, COP21, taking place in Paris this week, where world leaders including President Barack Obama will convene to discuss their plans to deal with climate change. On one hand, with this timing, the Coalition is capitalizing on the fact that clean energy is on everyone’s radar this week. On the other hand, the announcement smacks of a distinctly tech-centric belief, shared by so many in Silicon Valley, that there’s only so much that the government leaders gathered at COP21 will ever be able to accomplish without the private sector’s help. There’s no word yet on just how much the members of the coalition—which also include Jack Ma, Meg Whitman, George Soros, and billionaire environmentalist Tom Steyer—plan to invest. But they say they will fund startups in a range of industries, from agriculture to transportation to electricity storage. They’ll also focus the investments on the countries that are part of Mission Innovation—a consortium of 20 countries, including the US, that have committed to doubling their investment in clean energy over the next five years. akistan has recorded one of the highest temperatures in the world – 53.5 °C (128.3 °F) – on 26 May 2010. It is not only the hottest temperature ever recorded in Pakistan, but also the hottest reliably measured temperature ever recorded in the continent of Asia ..
A river, swollen by raging monsoon floodwaters, had torn down a bridge on the main road between Mumbai and Goa. More than 30 people are thought to have died when the great stone structure crashed into the torrent, taking with it two buses and a number of cars. Some of the bodies were swept more than 60 miles downriver in two days. Rescue workers search the flooded River Savitri after an old bridge collapsed in Mahad, western Maharashtra state, India, Wednesday, Aug. 3, 2016. In the heart-wrenchingly brutal calculus of the newsroom, this isn't a major story. But zoom out, and you begin to see the outlines of a much bigger and more worrying picture. India, indeed the whole South Asia region, has been riding a rollercoaster of extreme weather. The summer monsoon is the most productive rain system in the world, and this year the region is experiencing a strong one. The floods it caused have affected more than 8.5 million people; more than a million are living in temporary shelters; some 300 people have been killed. Though what really caught people's interest was the three baby rhinos rescued from the waters in the north Indian state of Assam. The fact that 17 adult rhinos drowned got rather less attention. But the important point is that the region is awash with water. Just a few months ago, it was a very different story. The previous two monsoons were unusually weak. The result was a terrible drought in northern India, and parts of Pakistan and Bangladesh. And it was exacerbated by another extreme weather event - record heat. India experienced its highest temperature ever this summer, a blistering 51C. Rivers ran dry; water holes evaporated; reservoirs became dusty plains. And, once again, the statistics were staggering. More than 300 million people were affected by water shortages - the equivalent of the entire population of the US. A city of half a million people was left completely dry. It had to rely on supplies brought in by train. As if that weren't bad enough, in spite of the drought, the country was hit by a series of unseasonal rain and hailstorms. They caused such terrible damage to crops that some farmers were driven to suicide. All these examples of extreme weather were widely reported, rightly so. What tended not to be discussed was the underlying cause. We are all interested in weather; few of us want to be told - once again - that our lifestyles are disrupting the global climate. Yet the truth is that many climatologists believe the monsoon, always fickle, is becoming even more erratic as a result of global warming. The picture in the last couple of years is complicated by the fact that the world has been experiencing a particularly strong El Nino, the periodic weather variation caused by warming of the sea in the Pacific. But a series of long-term studies have shown the number of extreme rainfall events in South Asia increasing while low-to-moderate events are decreasing. And increasingly erratic and extreme weather is precisely what scientists expect climate change will bring. The Intergovernmental Panel on Climate Change (IPCC) has predicted "rainfall patterns in peninsular India will become more and more erratic, with a possible decrease in overall rainfall, but an increase in extreme weather events". Three years ago he stopped growing rice on the farm in Bakrani, a village a few miles from Larkana, in southern Pakistan's Sindh province. The crop was too labor-intensive, and took too long to get to harvest, he said. Richer farmers, with more land, money and education, meanwhile, are finding the switch easier. That reality suggests Pakistan may face a future where an uncertain climate forces the poor - who cultivate over 80 percent of the country's agricultural land - out of farming unless they get help, experts say. He would like to join them, but the installation costs "up to $700 per hectare" are too high, he says. But 80 kilometers (50 miles) east, in Khairpur, 38-year-old Nawaz Somroo is using lasers to grow more cotton on his father's more than 80 hectares of land. Pakistani provincial agriculture departments have launched a few programs to boost farmers' ability to cope with climate change. Late last year, Punjab's chief minister also launched programs to help farmers with everything from new financial support to a distribution of more than 5 million smartphones.